Shouldn't another flag to go up as Bowser's flag comes down? Also I really like those fire works. The video quality stinks, but here's my WIP nonetheless. Did I go overboard with the particle effects? Having this much slashy dust hides the fact that the animations are pretty bad. (01-06-2018, 05:44 AM)Ostrich101 The video quality stinks, but here's my WIP nonetheless. Gotta grab my magnifying glass. From what I can see it looks good, but yes the video is much too small. Good work, though! (01-08-2018, 10:09 PM)$kog Did I go overboard with the particle effects? Having this much slashy dust hides the fact that the animations are pretty bad. I think that'd depend on what else is going to be happening on screen. If there are going to be a lot of other intense effects at the same time it might be a bit much. If anyone here is a fan of melee I just accidentally added a moonwalk to the game. @Evil Yoshi Toes - Yeah I think Im gonna reduse the bloom a bit so it doesn't appear so harshly. I mean personally I love the effect but that's just because I'm a huge fan of crazy comic-book style speed-lines in general. It looks way cool, dude. Barf I actually opened up Sticker Stage and started fixing things that were awful by transferring it to Studio. I fixed the My Music menu by making it 1000000% easier to navigate and use and also add more music to. ^ Now that looks very interesting; I assume a Captain Toad fangame installment is in the works here, possibly? (01-29-2018, 01:05 AM)Merit Celaire ^ Now that looks very interesting; I assume a Captain Toad fangame installment is in the works here, possibly? 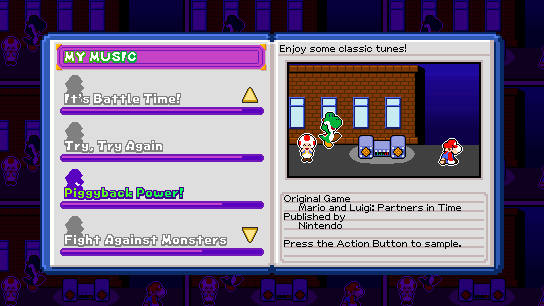 It is inspired by that SMW Captain Toad Rom Hack, but I am going to add a lot more content. Entry to the #inigame competition -early stages. Captain falcon meets paper mario meets anime I think I will call this game..
Fangame Maker update after like a year! An MFGG thread is probably coming soon. How is the title? I Bestow My Wish Unto You... Mushroom Soup is the full name. Mushroom Soup for short. I don't know if it's a spoiler since it's not really connected to anything, but the premise behind the title is it's going to be a quote from some spiritual entity that the main character encounters. "I bestow my wish unto you" is a direct quote, and the gift is "Mushroom Soup". 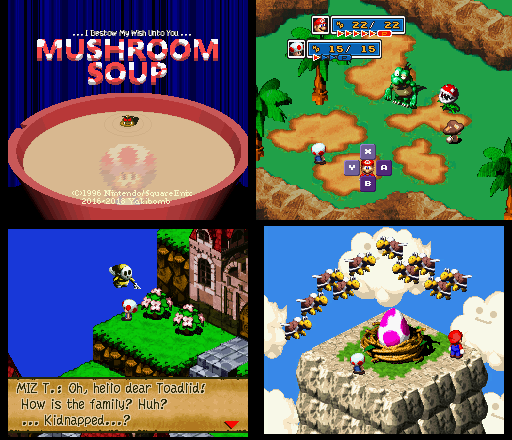 No further details other than mushroom soup plays a key role in the story. The "I Bestow My Wish Unto You" part is a bit hard to read, but otherwise it looks pretty good. Also, Mario's face looks kinda weird on the battle screenshot. I've got a new Fangame Maker update for y'all!